Heading Brings the joy of eating back. Directions Slowly add the recommended amount to the liquid. Stir briskly with a spoon, fork or whisk until the thickener is dissolved or use hand mixer or blender at low speed for no more than 5-10 seconds. DO NOT OVERMIX. After mixing, wait approximately 30 seconds for the liquid to thicken. Desired consistency recommended usage per 4 fl oz*: Liquids. Nectar consistency: 2-3 tsp. Honey consistency: 3-5 tsp. Pudding consistency: 5-6 tsp. Pureed foods. Pudding consistency: 2 tsp. Nutritional supplements. Nectar consistency: 2-3 tsp. Honey consistency: 3-4 tsp. Nutritional supplements: 5-6 tsp. 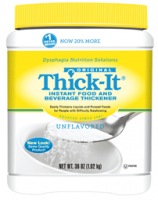 *You may need to adjust the amount of Thick-It needed to suit your requirements. Uses Brings the joy of eating back to people with swallowing problems (called "Dysphagia"). 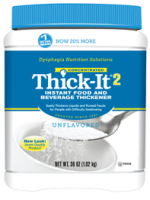 When mixed with hot or cold, thick or thin liquids and pureed foods, produces any desired consistency quickly, easily and controllably without changing the taste or appearance of the liquids and foods it thickens. Low in sodium. It helps prevent dehydration because it does not bind fluids. Recommended by doctors, speech-language pathologists and dietitians for patients in hospitals, nursing homes and rehabilitation facilities as well as the home.